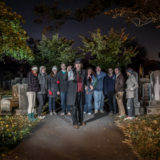 Enjoy ghost stories and candlelight walk following the footsteps of Generals Lee and Jackson. Meets outside of the Lexington Visitor Center. RESERVATIONS REQUIRED. May-October.